Resort Hopping is one of my favorite things to do at Walt Disney World! 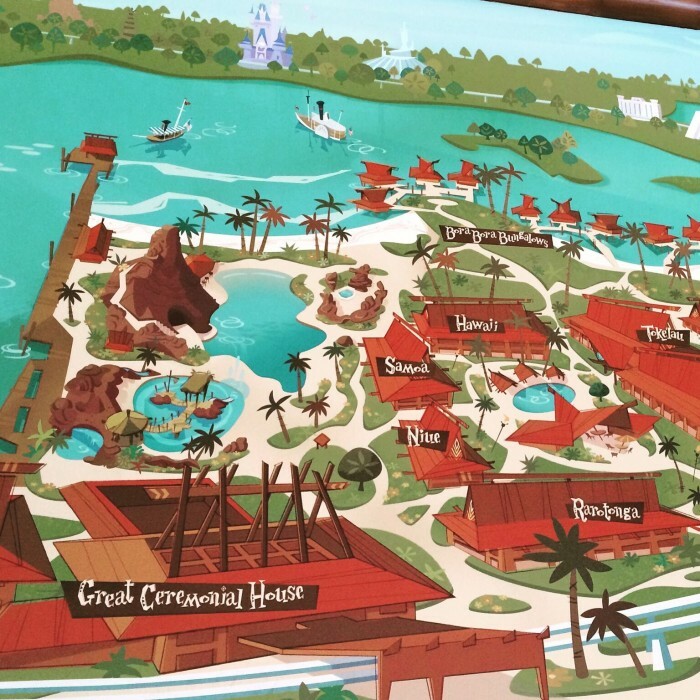 Visiting the Grand Floridian Resort and Spa, Disney’s Wilderness Lodge Resort, and The Polynesian Village Resort are as much on my trip to-do list as Pirates of the Caribbean or devouring a Mickey Premium Bar. That being said, I feel that guests who skip the resorts, or who don’t know they are allowed to visit the resorts, fail to achieve the full Walt Disney World experience. So for those who don’t know, anyone is allowed to visit the Walt Disney World Resorts, even if they’re not a guest of that resort or of any resort on property. But why should you? That’s what I intend to address in my five Disney World Resorts to See During Your Vacation! Let’s start with Walt Disney World’s flagship resort, shall we? The Grand Floridian Resort and Spa boasts a Victorian Florida theme and is Disney’s take on luxury and sophistication. But no need to worry about feeling out of place or having rambunctious kids in tow. While the Grand Floridian Resort is like stepping into an old fashioned postcard, this is a Disney World Resort after all! If driving your own car or a rental car, the Grand Floridian Resort is located at 4401 Floridian Way in Orlando, Florida, just off Seven Seas Drive. Free transportation to and from the resort consists of Disney Buses, Ferry Boats, and the most famous mode of Disney transportation of all, the Monorail! A 1 mile walking path between the resort and the Polynesian Village Resort is also provided, offering views of the Seven Seas Lagoon, the Wedding Pavilion, and the Magic Kingdom Park in the distance. A number of Walt Disney World Resorts boast awe-inspiring lobbies, and the Grand Floridian’s lobby is at the top of the list! In addition to a grand staircase, a cage elevator, and enchanting Disney-inspired tilework under your feet, the Grand Floridian’s 5-story lobby is topped with stained glass domes and massive chandeliers. Tip: For the holidays, a life-size gingerbread house and a towering Victorian Christmas tree occupy the lobby and are must-sees! 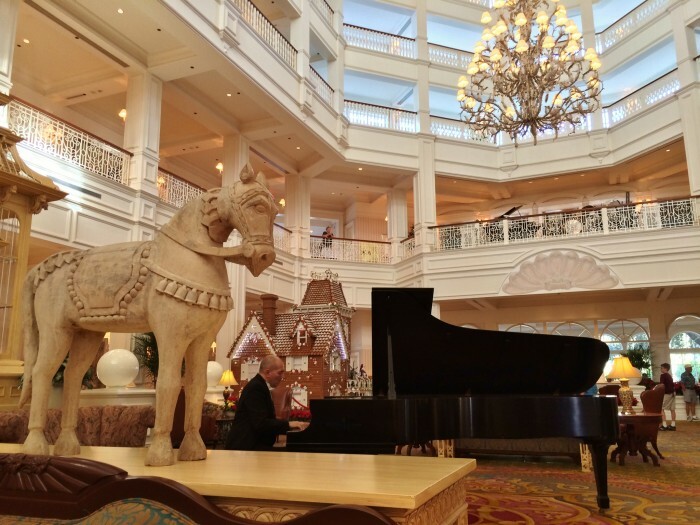 Throughout the afternoon and into the evening, a live pianist and the Grand Floridian Society Orchestra alternate playing popular turn-of-the-century tunes and Disney songs! The Grand Floridian Resort offers more shops than any other Walt Disney World Resort, which is why it’s one of my favorite locations to hunt for resort exclusive merch, Disney Dooney and Bourke bags, and that perfect souvenir to take home. 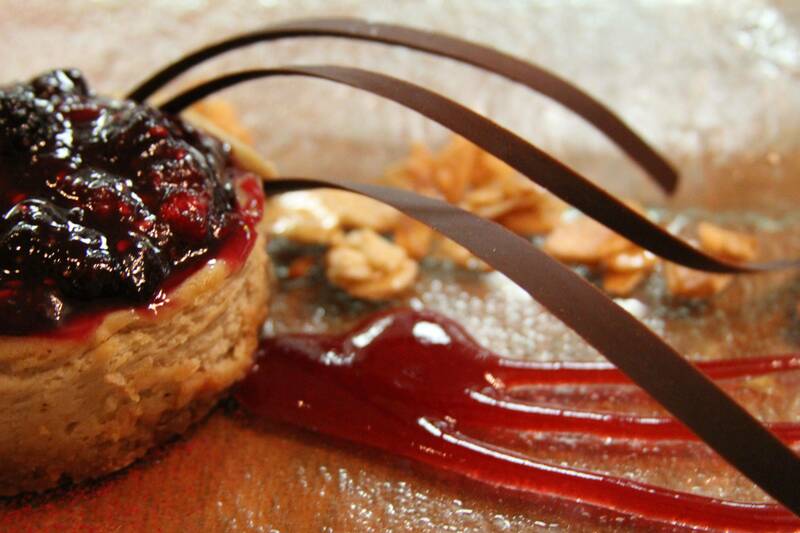 The Grand Floridian Resort is famous for its fine dining destinations. Victoria and Albert’s, winner of AAA’s Five-Diamond Award, is the ultimate splurge and setting for a special occasion. Other options include Citricos, Narcoosees, and the Grand Floridian Café. For families with little ones, 1900 Park Fare offers a buffet with character interactions, and the Garden View Tea Room offers a traditional English tea each afternoon. Need I explain? Senses, the Grand Floridian’s Resort’s spa, is the best way to recover from a long day at the parks with options and packages ranging from facials to massages to body treatments to nails and even kids services! 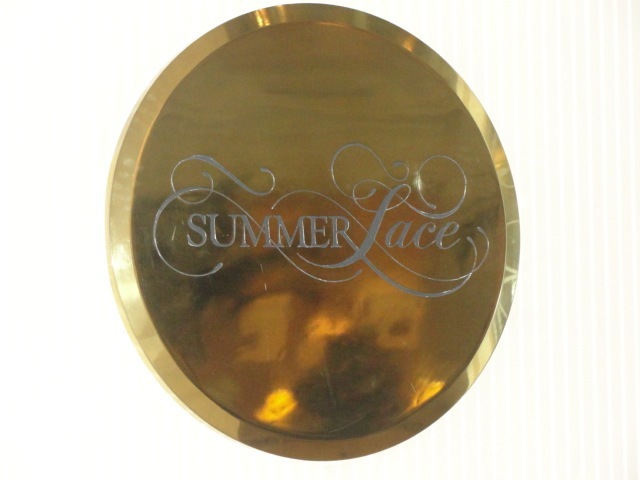 Learn more about Senses packages and prices here. The Polynesian Village Resort offers guests a South Pacific paradise all while in the middle of Central Florida! An original Walt Disney World Resort, the Polynesian Village is a fan favorite resort and sits across the Seven Seas Lagoon from the Magic Kingdom. If driving your own car or rental car, the Polynesian Village Resort is located at 1600 Seven Seas Drive in Orlando, Florida. Free transportation to and from the resort consists of Disney Buses, Ferry Boats, and Monorail. The Transportation and Ticket Center sits next door to the resort and can be accessed by a walking path. The Polynesian Village Resort is one of the best places to be when you’re hungry. You simply can’t go wrong with the resort’s luau, the Disney’s Spirit of Aloha Dinner Show, or ‘Ohana, Captain Cook’s, or the often underrated Kona Café. The Polynesian Village Resort is also home to the visually stimulating and interactive Trader Sam’s Grog Grotto, modeled after the original Trader Sam’s Enchanted Tiki Bar at the Disneyland Hotel in California. The Polynesian Village Resort offers a fairytale view of the spires of Cinderella Castle making its beautiful beach one of the best places to watch Wishes from outside the Magic Kingdom Park! 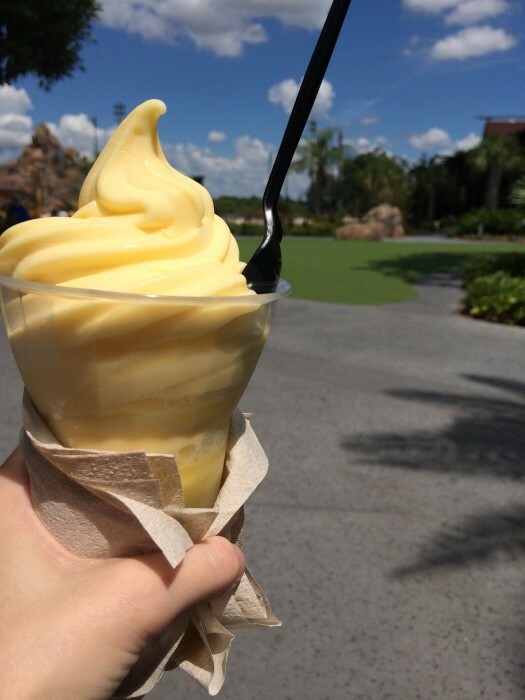 Dole Whips are one of Walt Disney World’s most famous treats and can only be found at certain locations. If you don’t want to wait in a long, long line to satisfy your Dole Whip cravings, head to the Polynesian Village Resort’s Pineapple Lanai. It’s a walk-up counter just off the lobby serving up Dole Whips and Dole Whips Floats with little to no wait! Perhaps one of the most unique resorts in the world, Animal Kingdom Lodge is about as close as you can get to a stay at an African wildlife reserve without ever leaving the United States. Animal Kingdom Lodge consists of two campuses: Jambo House and Kidani Village. Jambo House is the main resort building while Kidani Village is home to the resort’s DVC Villas. Both buildings feature incredible African architectural touches, views of live African wildlife, and more! Animal Kingdom Lodge is more removed than the other Walt Disney World Resorts, but features close proximity to Disney’s Animal Kingdom Park. If driving your own car or rental car, Animal Kingdom Lodge is located at 2901 Osceola Parkway in Bay Lake, Florida. Disney Buses are the only form of free transportation offered to and from the resort. However, a walking path and free shuttles are provided for those traveling between Jambo House and Kidani Village. 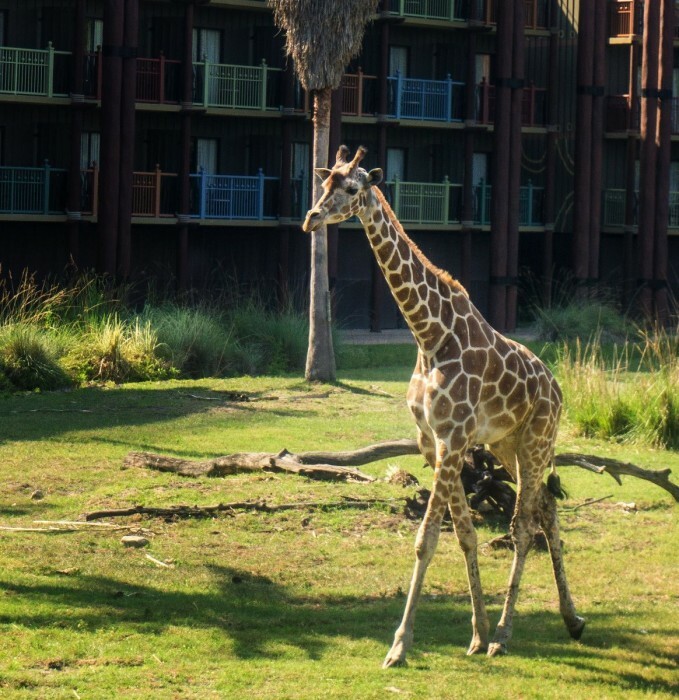 Animal Kingdom Lodge’s claim to fame is its views of live African wildlife. If you’re unable to stay at one of the resort’s Savanna View rooms, Jambo House’s Arusha Rock, located just outside the lobby, offers fantastic views of the animals and Cast Members are often nearby to answer any of your questions. There are a number of locations throughout the resort offering views of the animals as well. If you’re not visiting the Animal Kingdom Park during your vacation, Animal Kingdom Lodge is the perfect alternative and is completely free! While both resort campuses are impressive, Jambo House’s is massive and one of Disney’s best! Why? 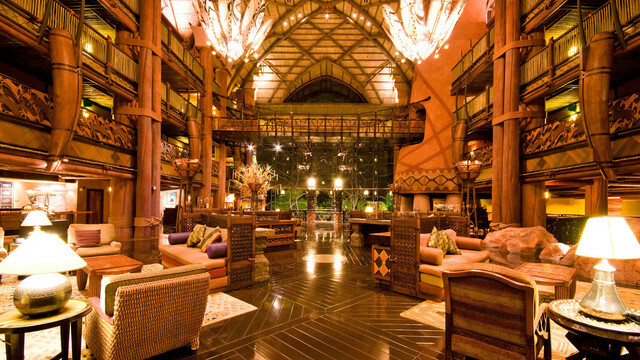 In addition to its size and a wall of windows looking out over the savanna, Jambo House’s lobby boasts tribal shield chandeliers, a thatched ceiling, a mud fireplace, and a waterfall system flowing down to the lower levels of the resort. Animal Kingdom Lodge’s restaurants offer cultural dining experiences with African-inspired menus coupled with a few traditional dishes too. 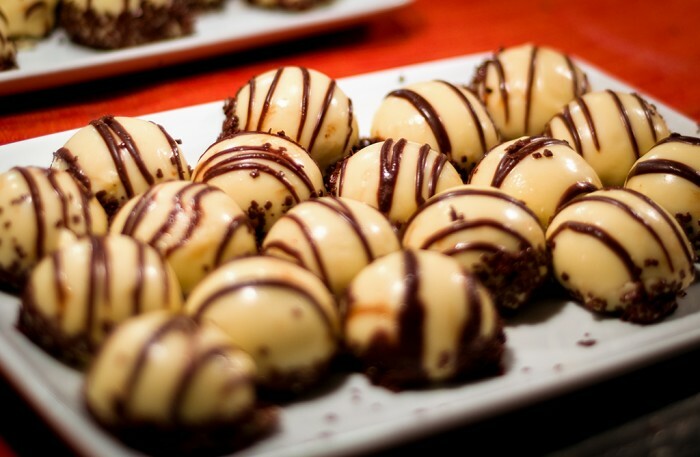 Boma – The Flavors of Africa is one of the most popular buffet restaurants at Walt Disney World, and both Sanaa and Jiko – The Cooking Place consistently receive rave reviews are considered some of Disney’s finest. The Contemporary Resort’s A-frame design is iconic and sits famously next door to the Magic Kingdom Park! It’s one of the original Walt Disney World Resorts, accommodating guests since 1971, but still looks and feels sleek and modern. If driving your own car or rental car, The Contemporary Resort is located at 4600 North World Drive in Orlando, Florida. Free transportation to and from the Contemporary Resort consists of Disney Buses, Ferry Boats, and the Monorail. Also, since the resort sits next door to the Magic Kingdom, guests can walk to and from the park via a short walking path. 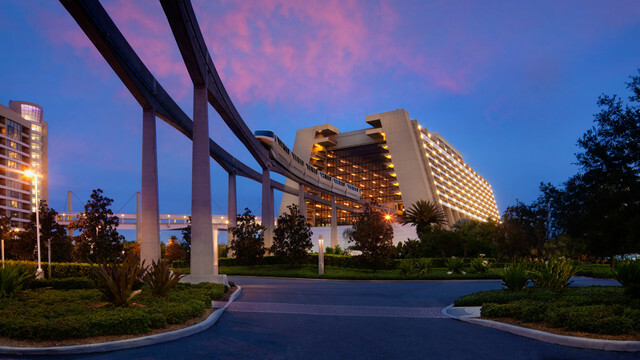 The coolest thing about the Contemporary is that the Monorail runs through the middle of the resort building! Guests are picked up and dropped off inside the resort and it’s so fun to see the different Monorails zipping overhead. 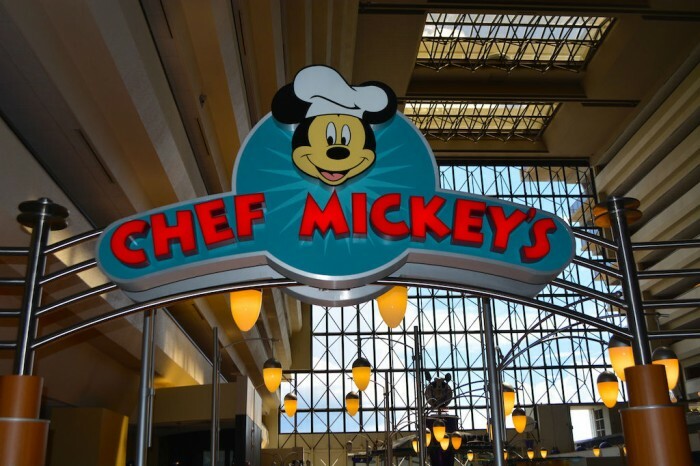 The Contemporary Resort has a number of fantastic dining options, such as Chef Mickey’s and the California Grill. Chef Mickey’s is one of the most popular character meals on property and the California Grill is known for its fine dining at the tip top of the resort with views of the park and Wishes! Due to the Contemporary Resort’s close proximity to the Magic Kingdom, it offers truly spectacular views of the park. Some guests visit the Contemporary just to watch Wishes from a different vantage point or if they want to enjoy some Disney magic for free! The showpiece of the Contemporary Resort’s lobby is a 90 foot tall mural by Mary Blair, the Imagineer behind the iconic look and style of “it’s a small world” attraction. This mural, however, focuses on area of our small world, the Grand Canyon and American Southwest. The mural also contains a humorous detail that’s always fun to hunt for… a five legged goat! Can you find it? 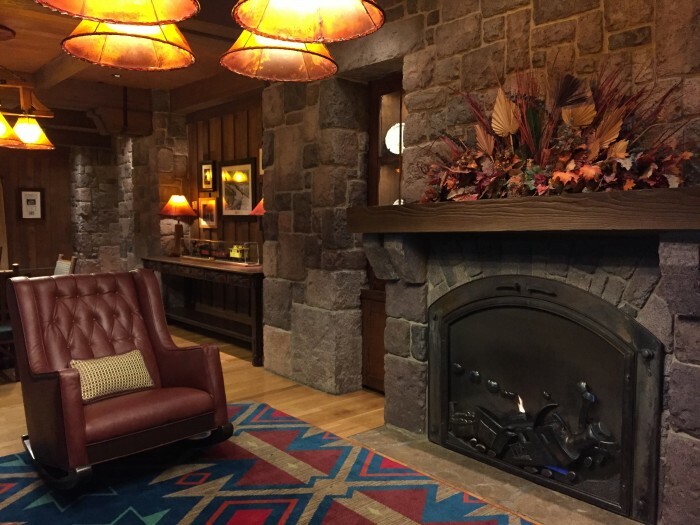 Disney’s Wilderness Lodge Resort is themed after the grand national-park lodges of the American Northwest, and those visiting the resort will find that Disney has captured the majesty of the parks and mountains and recreated it at Walt Disney World! This resort is the perfect, peaceful retreat from the heat and bustle of the parks, all while still offering plenty to do and discover. If driving your own car or rental car, the Wilderness Lodge Resort is located at 901 Timberline Drive in Lake Buena Vista, Florida. Free transportation to and from the Wilderness Lodge Resort consists of Disney Buses and Ferry Boats. Even though this Magic Kingdom Resort is not Monorail accessible, there is a 0.75-mile walking path to and from the Fort Wilderness Resort and Campground. Wilderness Lodge’s cavernous, eight story high lobby is my personal favorite and awes me each and every time I see it. 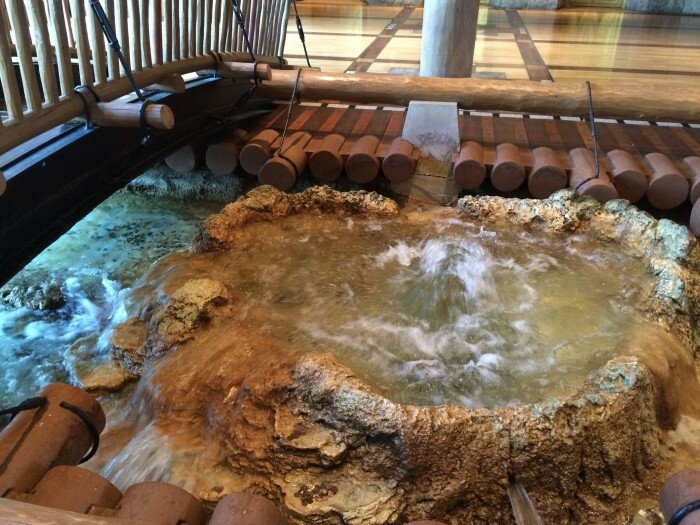 There is so much to see, such as the resort’s Grand Canyon-inspired fireplace, huge teepee chandeliers, towering totem poles, and a bubbling spring with a footbridge that flows on outside and into the Silver Springs Pool! Tip: Wilderness Lodge has towering lodge-inspired Christmas tree each year that practically scrapes the rafters and is a must-see if visiting during this the holidays. Details like Wilderness Lodge’s spring make it one of the Disney World Resorts to see during your vacation! Wilderness Lodge is one of my go-to dining destinations at Walt Disney World with restaurants like Artist Point and Whispering Canyon Café which more than delivers a Wild West experience. Territory Lounge is one of my new favorite retreats for its tasty appetizer menu and cozy atmosphere, and Roaring Fork’s array of Mickey Waffle breakfast platters are truly the best way to start a day at Walt Disney World. Tip: Whispering Canyon Café is currently home to the 10-Gallon Challenge Sundae, a mountain of ice cream and other sweets served up in a plastic cowboy hat! Located between the Silver Creek Springs Pool and the shores of Bay Lake, Fire Rock Geyser launches water into the air every hour just like Yellowstone’s Old Faithful. Formerly known as the Villas at Wilderness Lodge, the Boulder Ridge Villas are Wilderness Lodge’s DVC Villas. This wing of the resort has its own building with a lobby that’s worth a look. There’s also plenty of quiet corners and an abundance of rocking chairs too. Just off the lobby is the Carolwood Pacific Room that celebrates Walt’s passion for trains and the railroad history. This room also contains games for the whole family to play! As you can now tell, the Disney Parks don’t have a monopoly on the Disney magic! There is plenty to discover and enjoy at the Walt Disney World Resorts, but keep in mind that the five resorts I’ve listed are only the beginning! Disney’s Yacht and Beach Club, the Boardwalk Inn, the Art of Animation Resort, and more are definitely worth checking out as well. So be sure to carve out some time to do a little resort hopping during your vacation to see all that Walt Disney World has to offer! Savannah has been visiting Disney World since she was a year old and has gone back almost every year since. In the real world, she teaches high school history and government and enjoys writing about all things Disney. Savannah can be reached on Twitter @DisneyParkSavvy. New Fun For Mickey’s Not So Scary Halloween Party! I am so glad you posted this! Thank you! I have been thinking about resort hopping for the first time for our upcoming trip. What rules do you know of for guests visiting from other resort hotels? Is parking always free? Is there anywhere you cannot go or things you cannot do? Are restrictions heavier in busy times? Great questions! 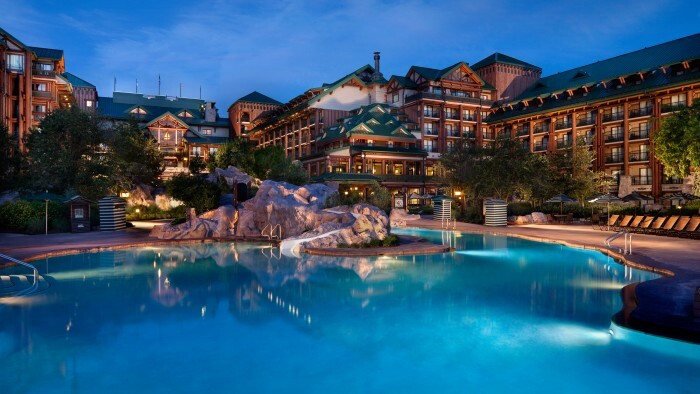 The only rule for guests visiting other Disney resort hotels is that they are not supposed to use the resort’s pool. In fact, some Disney resorts have gates around their pools and a Magic Band must be scanned in order to enter. Parking is free at the resorts but you may be asked at the gate your reason for visiting. 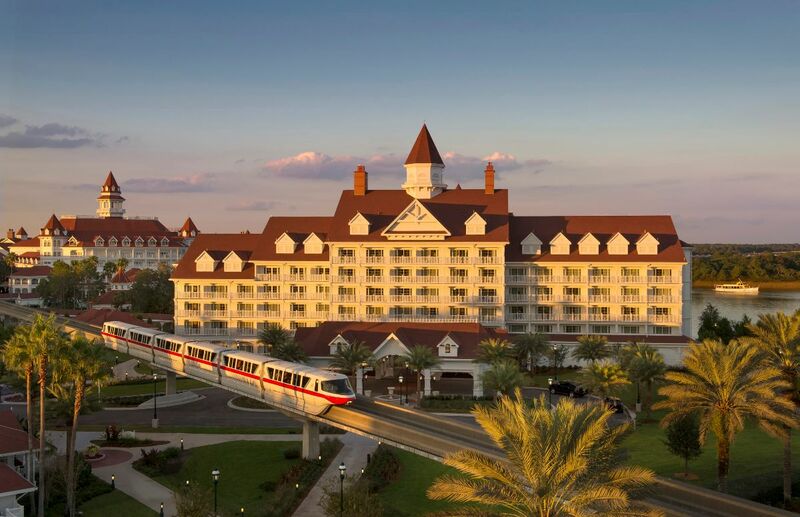 I’ve never been turned away for saying that I came to check out the resort or to dine at one of the resort restaurants; but if this is a concern for you, you can always use Disney transportation to reach a Disney resort hotel. No one will ask if you’re a resort guest or have you scan your band to visit. Other than that, anyone can visit a Disney resort hotel without restrictions and have a great time! Hope you enjoy your first resort hopping experience and thanks so much for commenting! Your mileage may definitely vary as far as parking. You will probably need to show a drivers license at the gate if you are not a resort guest. At the Contemporary, with an ADR, I was issued a 3 hour parking permit. One evening I was turned away at the Boardwalk, so I drove around to the Beach Club. Evidently the parking was restricted to resort guests or those with ADRs. The security guard there winked and said since I had young children and would be using a stroller, he would allow me to park. My kids were 8 and 10! Last spring at the Polynesian around midday I told the guard we just wanted to pop in for Dole Whip. She told me the resort was very busy and I could not park if I was not a resort guest. I then asked if I could just drop off my family and she allowed me through. The lot was half empty, and I found several 30 minute parking spaces, which I then utilized. I was a little aggravated that the guard did not even mention the short-term spots. So, parking may be restricted based on time of day, season, or the whim of the person working the gate. Thanks for sharing your experiences. I’m thinking that maybe the time of year is what makes the difference? Thanks for commenting so others can know what to expect! Thanks for the guidance Savannah and everyone! 1. Lunch and browsing at Disney Springs (easy access from any Disney Resort). 2. Bus to Wilderness Lodge. Explore. 3. Blue Flag boat over to the Contemporary. Explore. 4. Resort monorail to the Poly. Explore and stop by Trader Sam’s. 5. Resort monorail to the Floridian. Explore and grab dinner, as Gasparilla Island Grill is much better than any quick service in MK. 6. Resort monorail to Magic Kingdom for the Christmas Party! I’ve still never been to AKL, but this was a fun and efficient way to hit all those resorts on our way the evening’s festivities. Great touring plan, Andy! Thanks so much for sharing! I was in Orlando for a conference when Hurricane Matthew came. I’m a HUGE Disney fan local to Disneyland and have always dreamed of visiting the WDW resorts. I’ve looked them up online and had my wishlist. That Thursday the conference was cancelled so I toughed out some rain and drove my car rental to Animal Kingdom Lodge, had lunch at Sanaa, & shopped at the store. Then I went to Art of Animation. My flights were cancelled 2 days in a row so on Saturday I went to Magic Kingdom. By 3:30, I finished and took the ferry to Grand Floridian and visited the lobby. Then I walked the beach path to Polynesian and shopped and had dinner at Kona Cafe. I took the monorail to Contemporary Resort then back to Magic Kingdom! As a result, I’m determined to return with the family in 2019 and plan on staying at Polynesian Resort!! !